Give your loads some breathing room: One of the easiest ways to knock something off a shelf is to have too many items stored on one. Everyone who has worked in order picking probably can cite an incident where grabbing a stored box or bin pulled the one beside it off. That happens due to proximity; an edge catches on an edge. This may eat more floor space and require more shelves, but if you have the are to work in, it helps. Add a front strip to shelf levels: For picking operations that use shelving to hold bins, one of the easiest ways to drop product is to pull an entire bin out while reaching for parts. Slot difficult items in the “golden zone”. Retailers store their most profitable, most purchased items in the mid range, eye-level, easily-reached shelf levels in part due to increase sales, but also for ergonomic and accessibility reasons. You should do the same in your product slotting scheme. Putting the things most needed on shelves where it’s easier to get them means your pickers will not be reaching or stretching as often, which means they won’t drop it as often — or knock an adjacent product off the shelf. Guard the outside face of shelving on mezzanines: An order picker can easily push a stored item through to the other side, where it can fall to the floor level, which can result in product damage and some danger to workers on the other side. To alleviate this, use closed back shelving units or install safety nets on the outside of your shelving to help stop items from falling out. The heavier it is, the lower it should be stored. Like pallet racks, shelving does better if the heavier loads are stored on lower levels, not higher. Although most shelving (like most rack) is designed to store heavy loads on higher levels, if you have a choice, it’s better to balance your loads this way. Make access easy. If you have tall shelves, rather than forcing workers to reach or strain, provide shorter rolling ladders or stools for access. 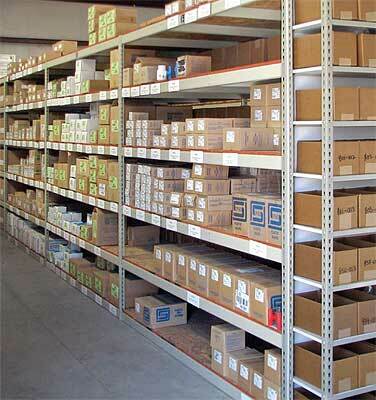 Heavy industrial shelving can hold lots of weight–more than a thousand pounds per shelf in the right configurations. But it does this only in evenly distributed configurations. If you are loading very heavy items, you need to ensure that the loads are centered and balanced. Shelving (as opposed to racks) is hand loaded, so when these heavier shelves are loaded, there is some risk of pulling the shelving down or pushing it backwards. 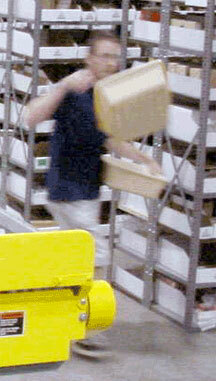 Be sure best loading practices are observed in terms of loading/unloading items. For instance, if you have a shelf with three bins, all full of hardware and one bin is picked more frequently than the other two, be careful that the difference in weight doesn’t unbalance the unit. You may need to reslot your inventory to get this right. These types of incidents are very possible in any warehouse where shelves aren’t loaded to the correct capacity or overloaded. You should clearly mark the capacity of each shelf, and post that on your shelving. If your storage area adjoins aisles where forklifts drive or pallet jacks are being pulled, a nudge can bring down an entire row or multiple rows. Traffic management, guard rails, bollards or other protective measures are advised for these situations. Although shelving is not always bolted to the floor, there are cases where it should be. You may have to check your shelf type and manufacturer specs to understand whether that’s required or recommended for your shelving units. Be certain your shelving was properly assembled and installed. Post-installation, inspect your shelf clips, rivets and other connections. Like rack, shelving is built with uprights (posts) and shelves that connect to them. If clips are loose or connections not fully seated, there is potential for a collapse. Regularly inspect to ensure no shelving units are leaning, have loose shelves, or have damaged components. It’s important to understand that inspecting any storage equipment that holds heavy inventory is a good use of your time and resources. Not only will you reduce product damage and prevent calamitous loss of inventory, you’ll protect your employees and also get a chance to find other issues in the operation.